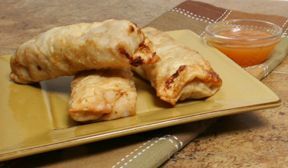 As an appetizer or a side to complement any Asian meal, these baked spring rolls will be a hit. You could even prepare them in advance and freeze them, just thaw before baking. Serve with soy sauce or teriyaki sauce. In a medium frying pan, cook ground pork over medium-high heat until evenly browned and cooked throughout; remove from heat and drain off fat. In a medium bowl, combine cooked pork, cabbage, carrots, green onions, fresh chopped cilantro, ginger, garlic, sesame oil, oyster sauce and chile sauce. Mix until well combined. In a small bowl, combine cornstarch and water. Place about 1/4 cup of the pork mixture in the center of each spring roll wrapper. Roll wrappers around mixture, folding edged in to enclose the filling. 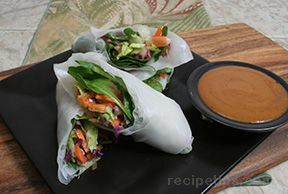 Moisten edges of spring roll wrapper with cornstarch mixture to seal. 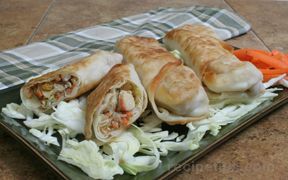 Place filled spring rolls in a single layer on an ungreased baking sheet. 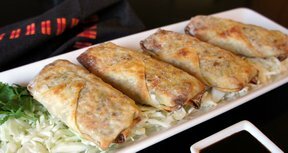 Brush spring rolls with vegetable oil and bake in oven for 20 minutes, until lightly browned. NOTE: For crispy spring rolls, turn rolls after 10 minutes of baking time. "The filling was great! I didn't care for the wrappers I used, could just be the brand. I served them with sweet and sour sauce."